Raybestos has updated its raybestos.com website to reflect the “Big Brake Thru” product line realignment recently introduced at AAPEX 2018. 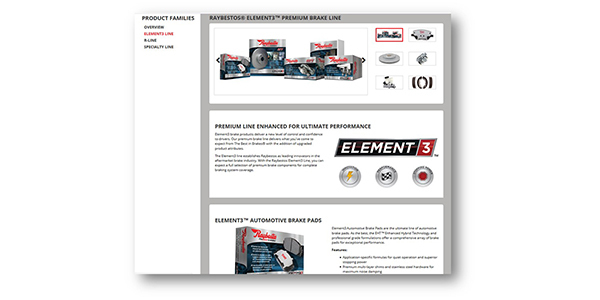 The updated website now features a “Product Families” tab that takes visitors to an overview of the new Element3, R-Line and Specialty product families. Separate pages for each line deliver more detailed product information, including features and benefits, and show photos that illustrate the distinct packaging designed to healp customers manage inventory and quickly select the right brake parts for each job. The online product catalog also has been updated to reflect the new family groupings, including pad and rotor kits for top applications, allowing users to easily identify the best parts for their brake jobs. The catalog contains improved product attributes such as English and metric measurements for all dimensions and added resources for each product. Robust filtering options save time and help users find exactly what they need. To learn more about the Raybestos Element3, R-Line and Specialty product families, click here or contact your Raybestos representative.